If you don’t already have digital marketing skills, you need to get on that. Company managers and clients alike think digital marketing is a simple thing they expect everyone to know. 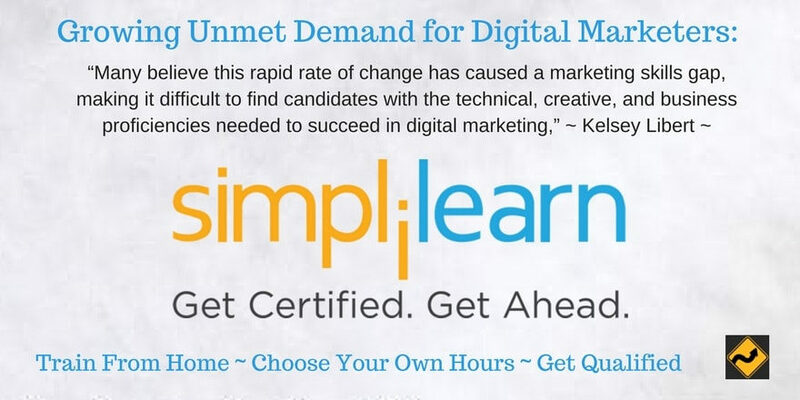 The place to start is with this Digital Marketing Certified Associate Training Program (DMCA). Many people claim they do marketing or social media, but when I try to pin them down on exactly what skills they have, often they are far too limited. They are unlikely to get hired or be able to keep a job long-term because of their limited expertise. Digital marketing done well is complicated and takes years of experience to learn. But people doing the hiring often don’t seem to know that. 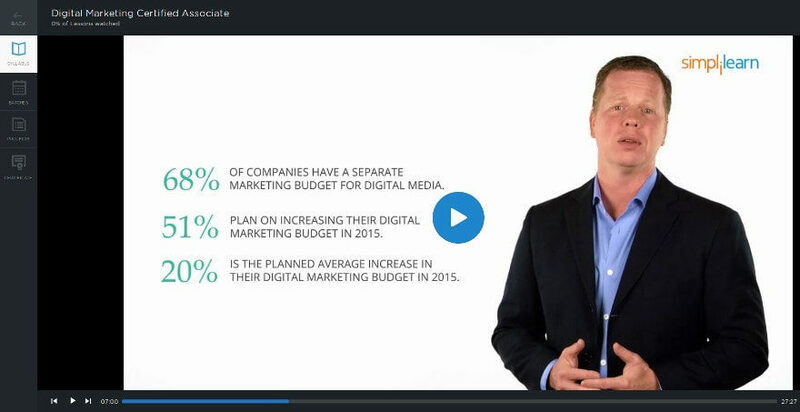 They expect you to know about every type of digital marketing, analytics, and to be able to show results through measuring ROI (return-on-investment). Demand is so strong that 70% of those doing the hiring are willing to hire people who work from home. What that means is there is huge opportunity, but only if you expand your skills. Even if you specialize in one or more of these, it is important to have a working knowledge of other types of marketing your employer or client should be utilizing. Fortunately, there is an efficient and affordable way to get this type of training online from anywhere you can get an internet connection: Simplilearn. 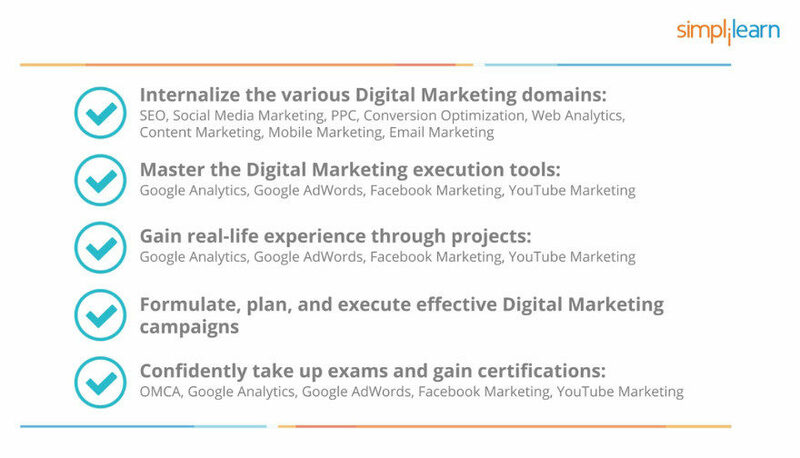 They have courses covering every aspect of digital marketing. Connect to your LinkedIn profile or manually update your profile. Then jump right in by clicking “my courses” on the home page. You can easily move around within the courses and see the curriculum. 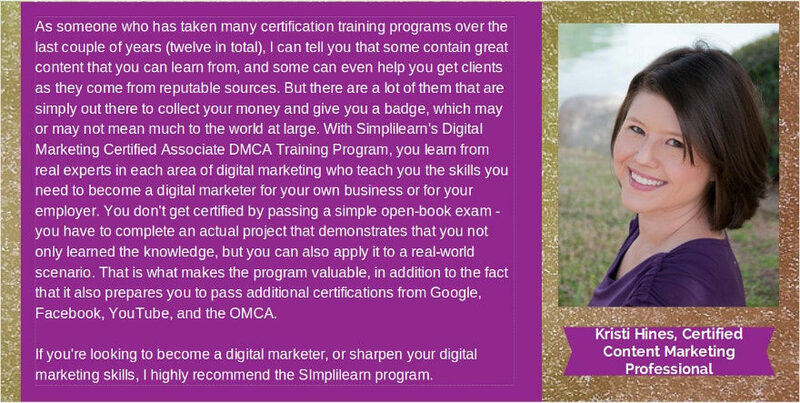 The place to start is with the Digital Marketing Certified Associate Training Program (DMCA). That page provides full details including one of the two reasons I can recommend this training. The second reason is that I am going through the courses myself now. The foundation courses are easy for anyone to understand while quickly conveying the basics needed. Later courses get into more depth. If you have advanced marketing skills, some of the training modules may be a review for you. If you are new to any part of digital marketing or are managing marketing personnel, these courses will provide the foundation you need to fully understand digital marketing. Each lesson contains an introduction explaining what you will learn in that segment, a video training, and a test. 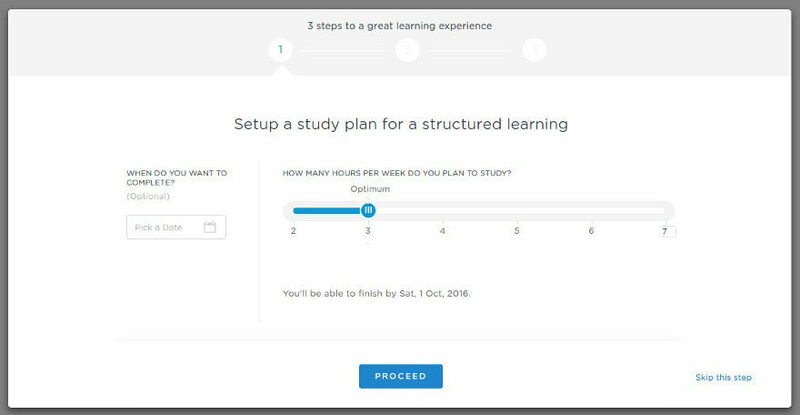 Each segment has an estimated time so you know whether you can complete it in the time you have available or need to wait until later. Any marketer trying to decide what they want to specialize in or wishing to increase their overall skill levels should start with this course. The screen capture below shows the dashboard and the large video format that makes it easy on the eyes. I really suspect that most social media managers I’ve met do not have a clear social media strategy. Even if you have been hired to manage social media for a company and have your own accounts, that does not necessarily mean what you are doing is working. Just as important as what you do is how and what you measure. Are you targeting the right audience with the right message in the right place (where they are already active and most interested in hearing it)? This course covers social media strategy, making your messages sticky and more viral, and social media channels beyond just the main social media networks. This final image is what they referred to as “The Bottom Line”. 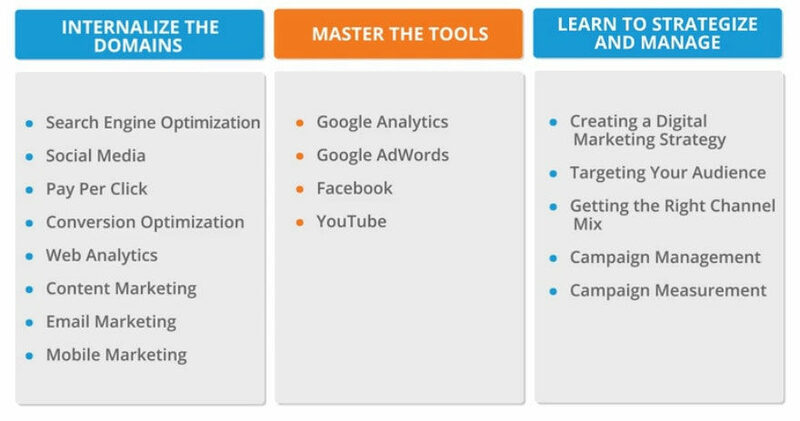 It shows in one graphic what this digital marketing training covers, what you can learn, and especially note that they offer real-life experience through projects. Having hands-on experience is far more valuable to gain confidence in your skills and ensure you will retain what you learned. Study on any device with internet access. Simplilearn offers IoS and Android apps (available in the App Store and on Google Play). Do you have questions you’ve never managed to get fully answered? For example, do you really know what duplicate content is and is not? Do you know how to do keyword research with user intent in mind? This course will answer these questions for you. Are you an SEO who still measures success by where you rank in the SERPs? 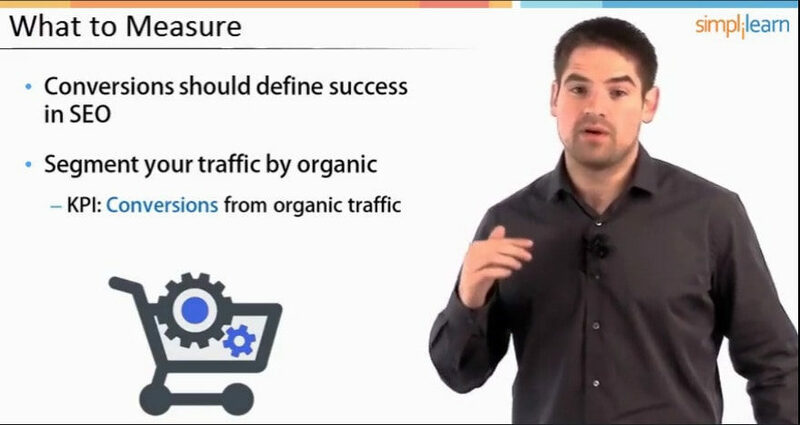 You definitely need this course, and in particular the SEO measurement module. Wondering how Penguin and Panda affected sites you care about? Check out Lesson 9 on Algorithm Updates and SEO changes. If you don’t know how to measure your results or keep current on your skills, have I got a deal for you. For a limited time, the first 25 people who sign up can take the Simplilearn SEO Foundation and/or Content Marketing Foundation courses totally free. Although the end date is December 21, 2016, I don’t expect ANY spots to be left for very long. If you want to do this, you need to sign up RIGHT NOW before others take all the free spots. I know most of my readers are heavily involved in content marketing, so this offer may go even faster than the SEO offer does. 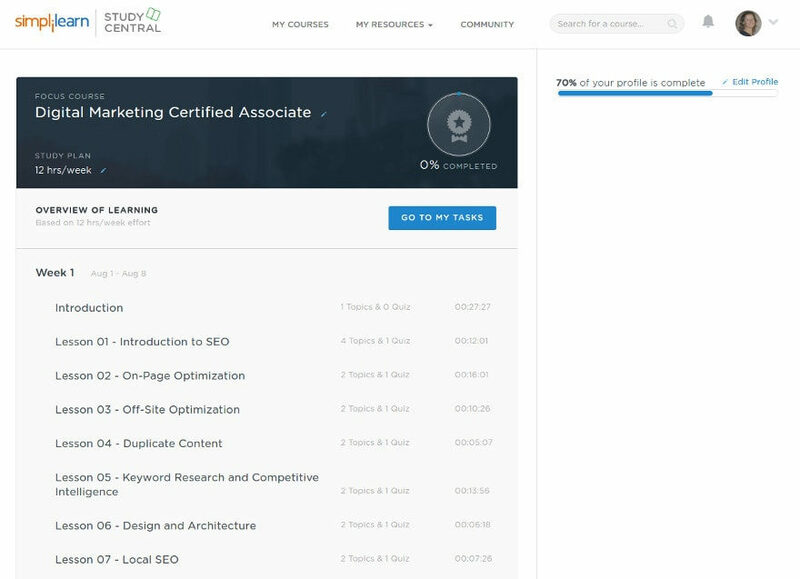 Go to this link to sign up for the Simplilearn Content Marketing Foundations course. How to develop best practices for content across media types, including social media, images, etc. Again, please note that the free spots are bound to go really fast, so if you’re interested, do not wait. This is NOT a marketing ploy. I really do know a lot of people who may want to do these courses. We have 129 just in our Blogger Mastermind Skype group. I’ll let my subscribers and social media followers get a chance to see this before I share it there; however, I can’t keep someone else from sharing it. 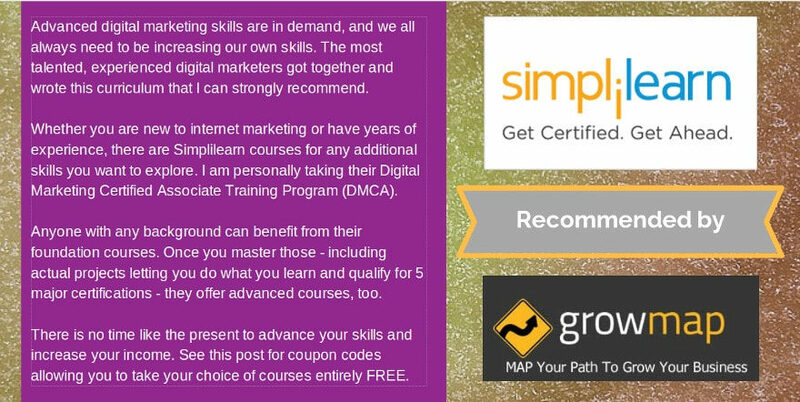 Access to these modules is a part of the Digital Marketing Certified Associate Training Program (DMCA) I am taking now. So if you have questions, ask them in the comments. hey admin thank you for this great article about digital marketing training and I think everyone should read it to gain more and more information and get train theirs. I also wrote an article on my blog ElkeesMedia .com about Social Media PR benefits . Congratulation ! Digital marketing strategy is an endless skill to learn. There is always new change on the the market trend. I am sure DMCA will be the answer. OUTSTANDING advice, Gail – not only for bloggers and content marketers but also for high school and college / University students to know about. These are the comprehensive courses that new bloggers, marketers and students would highly benefit from. Sure it’s great to improve specific skills, i.e. blog writing. But expanding your skills helps you become hireable and/or knowledgeable when hiring a team who supports your biz. Appreciate your course research and shared wisdom, Gail! Thanks, Keri. I just completed the live sessions for the DMCA foundations courses and will be doing the projects and then moving on to the advanced courses. It makes far more sense to do this type of specific, current training than to get a degree that may or may not provide skills anyone would actually be willing to hire you to perform. Hi, Thank you for the information in your post. Waiting for more helpful post like this one. By the way, nice theme… Congratulations, this blog is amazing! Welcome, Daniel. Thank you. There is always more to do, though. If you take the training while there are free spots open you’ll learn a lot more. Hi Gail Gardner, Thank you so much for reply and the information. I am your blog lover. Thanks for sharing such a fabulous opportunity Gail! I definitely feel like I’ll be learning from the real pros, from the ground up! I only wish I would have know of this opportunity sooner! Because I would have gladly help spread the word too! Mark would love you to read ..How To Take Advantage Of One Of The Most Powerful Small Business Tools! I’m glad you got one of the available spots. These are the courses I’ve been recommending for years, but I never got 100% discount coupons to share them before. Another Helpful Article, Basically I have some knowledge about Digital Marketing, but in this article I have got more ideas Thanks A Lot for shared. Don’t miss that you can sign up for 2 foundation courses (SEO and Content Marketing) entirely free. The discount codes are in the last image in this post, but the discounts will only work on the first 25 spots for each course. I’m glad you secured your spots. You’re right, it never hurts to make sure there aren’t any gaps in your knowledge – especially when you can do it for free. Do check out their other courses, too, while you’re signed in. I’m doing a bunch of others, too, so if you questions about them just ask.